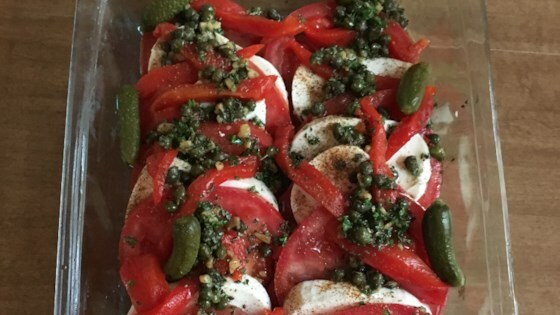 "I had to make something for a work function, so I created this simple platter of mozzarella and tomato slices topped with roasted red peppers and an herb mixture. Serve chilled with toothpicks or bread slices. Omit the capers or add black olives as desired." In a medium bowl, mix together parsley, basil, oregano, capers, garlic and olive oil. On a serving platter, arrange mozzarella cheese slices and tomato slices in alternating layers. Top with roasted red peppers. Drizzle with the herb and olive oil mixture. Cover and chill in the refrigerator 30 minutes before sprinkling with crushed red pepper and serving. I made this for a party and the only thing I changed was I dribbled some balsamic vinegar over it.